The College has a long history of links with South Asia. The first partnerships between academics at the College and the Indian Institute of Technology Delhi began in the 1950s and continues to this day. In 2007 the College launched the Rajiv Gandhi Centre to help Indian and UK companies improve performance in innovation and entrepreneurship. The College has a long history of links with India and there is world-leading research taking place with Indian partners across all areas of the College. There are over 250 Indian students currently studying at the College and over 1500 Imperial Indian alumni. The College has participated in many of the large-scale UK-Indian government funded projects including UKIERI, RCUK-India government research and innovation partnerships and, more recently, the Newton-Bhabha Fund. In June 2016 the College hosted a delegation led by Dr Harsh Vardhan, the Minister for Science & Technology and Earth Sciences. The Minister met with Professor Alice Gast and learnt about some of the many collaborations taking place across the College. The College’s Business School has established the Gandhi Centre for Inclusive Innovation, to help Indian and UK companies improve performance in innovation management. The College’s Grantham Institute for Climate Change is working with IIT Mumbai and other Indian partners on a Newton-Bhabha programme to understand the effect of climate change on water availability in the Indo- Gangetic Plain. Researchers in Biomathematics have established the Imperial College-India Biomathematics Bridge. The network has links with TIFR-Mumbai and IIT Bombay. In 2007 an Indian supporters association, the Imperial College India Foundation was founded. The foundation exists to promote research collaborations between industry in India and the College and to increase the College profile in India. The Department of Civil Engineering and the Department of Epidemiology in the School of Medicine are working collaboratively with the University of Dhaka to research the impacts of water salinity on health in Bangladesh. The College recently hosted a group of Pakistani Vice-Chancellors as part of a British Council study tour. The delegation spent three days at the College meeting with students, academics and administrative staff. The Nobel Prize winning Pakistani physicist Professor Abdus Salam was one of Imperial's most famous physicists. He was appointed Chair of Mathematical Physics at the College in 1957 and continued to have associations with the theoretical physics group until his death in 1996. In Sri Lanka, the Department of Civil Engineering has advised on the construction of the Southern Expressway. 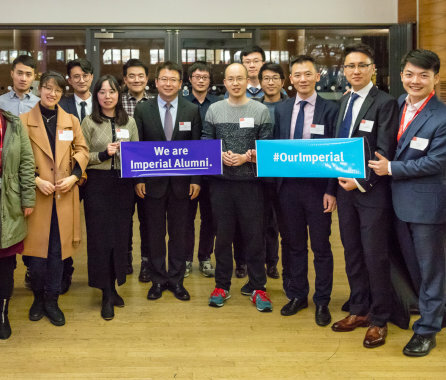 Are you from the South Asia region, and interested in studying at Imperial?